The Old Colony Railroad extension to the Town of Falmouth, Massachusetts was incorporated in 1861; however, the Civil War delayed the start of construction until 1866. The railroad extension was completed in 1872, and had a great impact on Falmouth and Woods Hole. 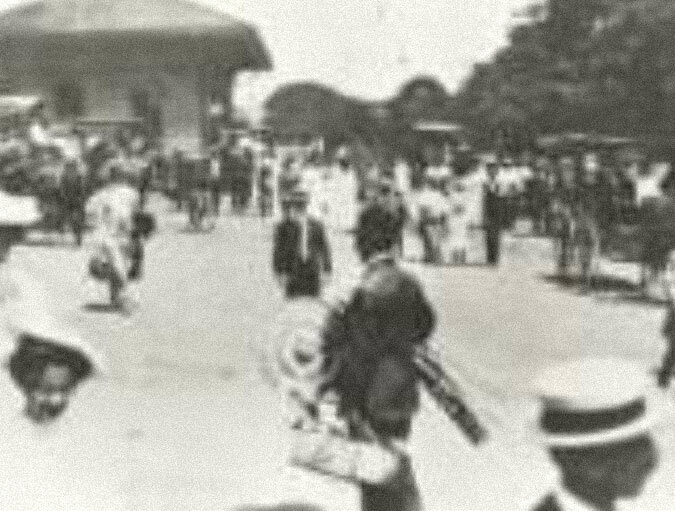 With the railroad, a small agrarian community and dying maritime economy was transformed into a commercial center and a summer resort area. In the first season over 1,000 people per day rode the train to Woods Hole. Large estates were built in Falmouth and the summer tourists were attracted to the beaches and temperate climate of the shore. The trains served the Pacific Guano Works, which began making fertilizer in Woods Hole in 1863. The plant mixed fish, sulphur, and guano from Pacific islands for transport to market until it closed in 1889. After that time, the Penzance Point area was developed and became one of the wealthiest summer areas in Town. The James Madison Beebe family from Boston acquired 700 acres of land above the Falmouth Station, and built two grand residences at Highfield Hall in 1878 and Tanglewood in1879. The Beebe family entertained in their summer homes in Falmouth for more than fifty years. New summer resort communities were developed along the shore from Chapoquoit and Quissett to Falmouth Heights and Menuahant as many tourists used the railroad for their summer visits to Falmouth. The Falmouth Station was a very active place in town with a passing track and a freight yard that was often filled with freight cars. Many local businesses were dependent on the railroad including: Falmouth Coal Co., Lawrence Grain Co., Crystal Oil Co., and Wood Lumber Co. Some businesses had private railroad sidings for unloading their deliveries. Also, carloads of fresh fish from the shore and fresh strawberries from the East Falmouth farms were iced and quickly sent to market in Boston and New York. For example, Sam Cahoon had a thriving fish and lobster business in Woods Hole and sent at least two freight cars every night to Boston. A passenger train, the Flying Dude, ran an express train service by subscription from 1884 to 1916 between Boston and Woods Hole arriving in 1 hour and 40 minutes. In addition, a later seasonal train, The Day Cape Codder, ran from Grand Central Station in New York City leaving at 8:20 am and arrived in Woods Hole by late afternoon from 1986 to 1996. In summer, fifteen passenger trains a day came through Falmouth as well as two post office cars. The Falmouth Station has remained, over the years, the property of the state. The hurricane of September 21, 1938 was a critical event as more than four miles of rail were washed out and caused extensive damage to the Woods Hole railroad yard, many railroad cars, and the electrical system. Service was restored later that year and regular passenger service continued to Falmouth and Woods Hole until 1964 with weekend-service from 1982 to 1988. World War II saw a very large increase of train traffic to Camp Edwards and Falmouth. Hundreds of steel landing craft were sent to Falmouth for training and testing in the coastal waters and then sent to the European theater of operations. 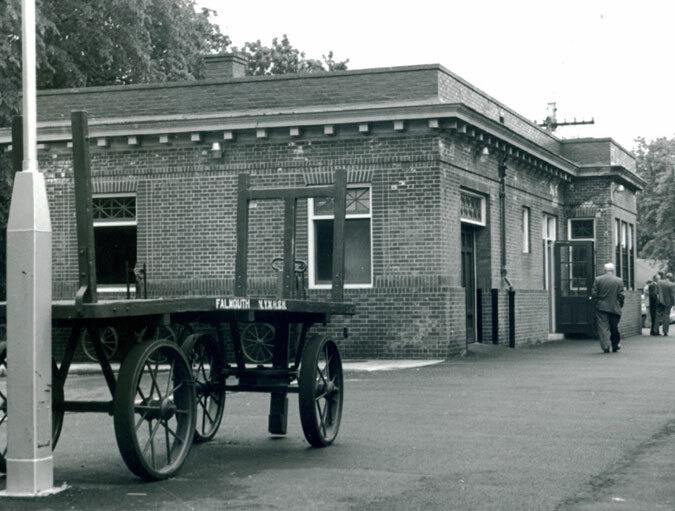 The original was built of wood in 1872 and provided service for more than forty years. A new brick station was constructed in 1913 in Greek revival style with Doric columns, and an iron and glass canopy. A portion of the Falmouth Station property, along Depot Avenue, falls within the Falmouth Village Historic District. The Station however due to its setback from the street, is not included within that Historic District boundary of the town. In November 1988, the Station was refurbished by the Massachusetts Department of Transportation (MassDOT). The restoration included the resurfacing of the parking lot, improved facilities, a new ticket area, refurbished waiting room, and exterior landscaping. 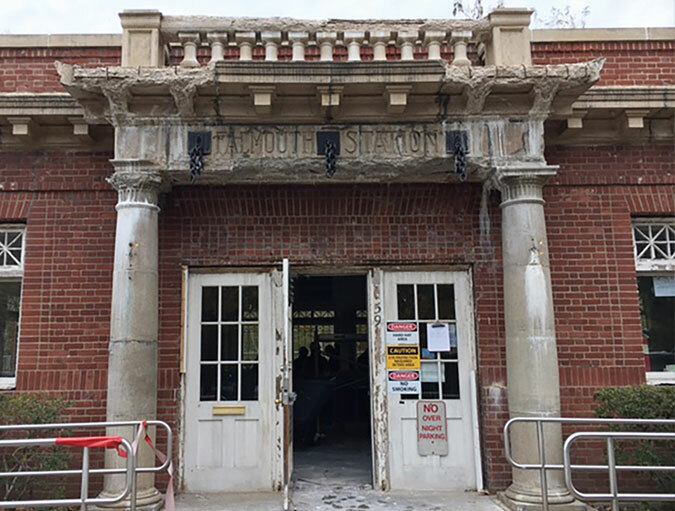 As a result of the deterioration of the concrete on the face and dental work of the building, a temporary wooden frame was installed in 2009 at the entrance to protect the passengers from falling debris. Also, the canopy was removed for safety reasons. In addition, there continues to be a general deterioration of the building and surrounding area. Unfortunately, this historic building has deteriorated and there is now extensive damage to the structure including the failure of the stone cornices and the brick work, and has resulted in roof leaks creating health and safety concerns. At the present time, the Falmouth Station is served by: Peter Pan Bus Lines (with service from Woods Hole and Falmouth to Boston, Logan Airport, Providence and New York City), the Cape Cod Regional Transit Authority (CCRTA with service from Woods Hole to Hyannis and other towns on the Cape), the seasonal Trolley to Woods Hole, and the local taxi companies. The Shining Sea Bike Path runs along the Station that attracts many visitors to the Town. The Bike Path follows the original route of the railroad to Falmouth and Woods Hole. In the early 1970's the Town of Falmouth acquired the railroad right-of-way, removed the tracks and officially opened the 3.3-mile Bikeway in 1975. In 2009, a new 7.4-mile section was added to extend the Bikeway to North Falmouth. The two sections of track on the west side of the Station remain. The Falmouth Economic Development and Industrial Corporation (EDIC) is a quasi-public entity created in 1981 for a public purpose. In 2015, EDIC executed a long-term lease agreement with the state to rehabilitate and operate the Station with funding from the Mass DOT. The EDIC began a process for the design and construction of a rehabilitated station. The EDIC executed contracts for the project management and the architectural design of the Station. EDIC also appointed a Citizens Advisory Committee to coordinate public input for the historic rehabilitation of the Station and the development of the surrounding area. Competitive bids were received for the rehabilitation of the Station in September 2016 and the project is expected to be completed in the spring of 2017.